FAIRFAX,VA – There’s nothing more beautiful than a newly built home framed by mature trees. And if you’re searching for houses for sale in many rapidly growing Fairfax and Loudoun County residential neighborhoods, you know there’s nothing more scarce, either. It’s simply a lot easier (and less expensive) for a home builder to remove all the trees when siting and building a home, rather than to preserve and work around them — that’s if the property even has trees on it to begin with. * Trees are said to increase property values by an estimated average of 3-7 percent, even up to 10 percent, according to the US Forest Service. * They improve air quality — Trees absorb gaseous pollution & can hold pollen, dust, smoke and ash on their surfaces. They remove carbon dioxide from the air (the average tree removes up to 300 lbs of carbon dioxide per year. And healthy trees can produce 260 lbs of oxygen per year). * Trees protect the environment by reducing storm run-off and noise pollution. * Trees help keep homes cool in summer (shade your home) and warm in winter by reducing the amount of wind and cold that comes in through windows and doors. * Researchers at Texas A&M found that looking at trees five minutes a day also reduces stress. 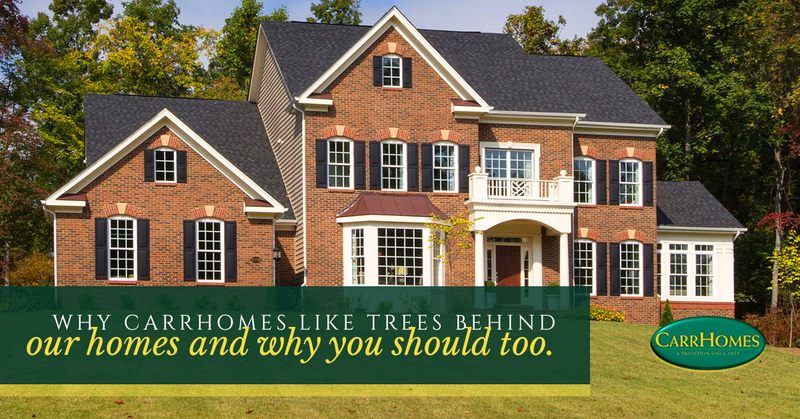 At CarrHomes, our luxury home builder team is committed to preserving trees wherever we can. That’s why you’ll find some of Fairfax and Loudoun Counties most beautiful 1-acre to 5-acre wooded homesites at: The Meadows at Great Falls in Great Falls; Waterford Creek in Hamilton; and Clifton Point in Clifton, Virginia. Come see our houses for sale (and our trees). For more information on what makes CarrHomes luxury homes a cut above the rest, just click here.